As The venue was brand new to me I didn't have a clue what draw was good and what was bad. I pulled out peg 35 on Lizard for myself and peg 11 on Lake 5 for my partner Carl Shepherdson. Not the best of winter draws apparently, but hey ho! 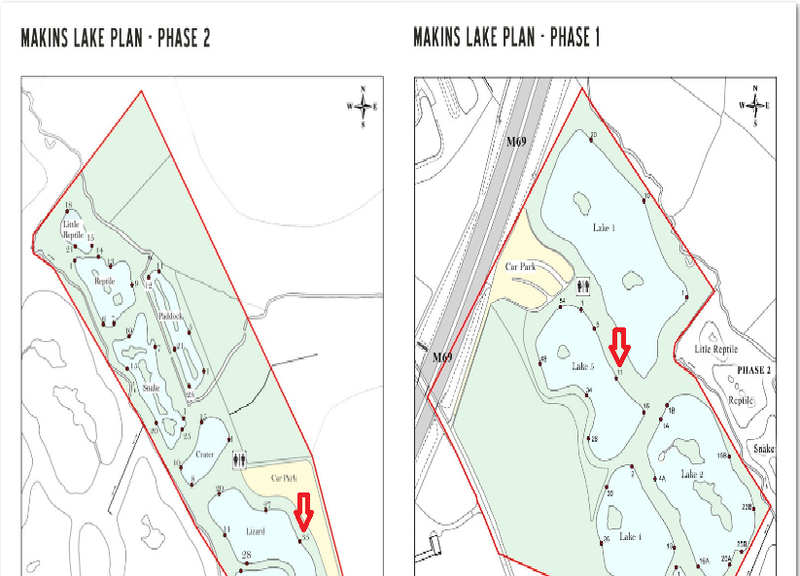 area of the lake, but on the plus side I had a really small little island in front of the next peg to my right. This was within reach at just over 13 meters. I also had a small tree growing into the water just to the left of my peg. I was hoping these would be good fish holding features. My plan was to target 4 separate areas, one at 13 meters directly in front of me, and a second at 13 meters towards the little island. The third and fourth line were to be fished at at top 2 plus 2 distance, one in front of me in line with a far bank tree and the second to my left in front of the tree. I opted for a really simple bait tray which included maggots, casters and a few pinkies. I also had a bit of groundbait. 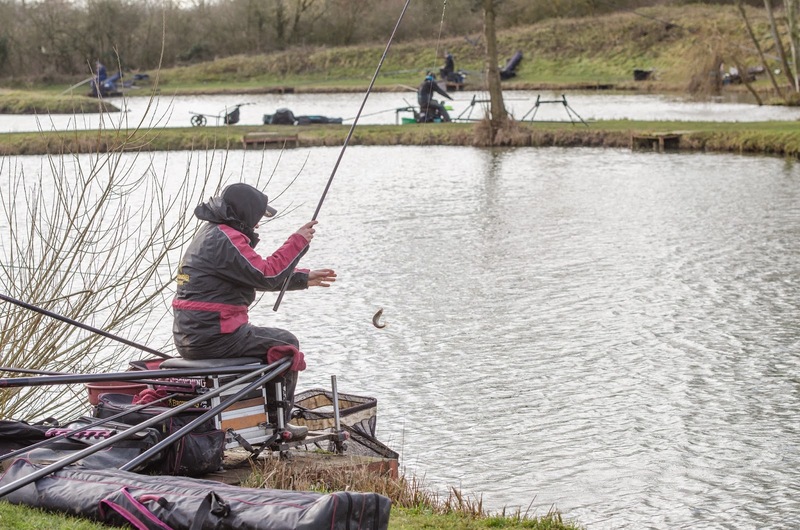 I started the session by feeding a single ball of groundbait by pole pot onto the 13 meter line directly in front of me and 2 balls onto the 13 meter line towards the island. The reason for this was that I planned to leave the island line the longest, so I wanted a bit of feed down to hold the fish their once they arrived. I started on the short line as this would give the longer lines time to settle. I had decided that I would just feed loose maggots on this line as this tends to get quite a quick response. Proof was in the pudding as I started catching almost immediately; the fish were really small Roach, but at least I was getting bites! After 10 minutes I opted to switch to the 13 meter line in front of me, I was hoping some bigger fish had settled over the groundbait. A couple of quick tiny Roach was followed by a bite-less 5 minutes. Something seemed to be unsettling the fish and I had a feeling it was the loose feed I was catapulting over the top, so on switching to the island line I decided to leave loose feeding over the top to see how this line reacts. This definitely made a difference as I was now getting regular bites but again the fish were really small. I needed to do something to get things going properly, so I topped the 13 meter line in front of me and the short line with 2 balls of groundbait on each line. 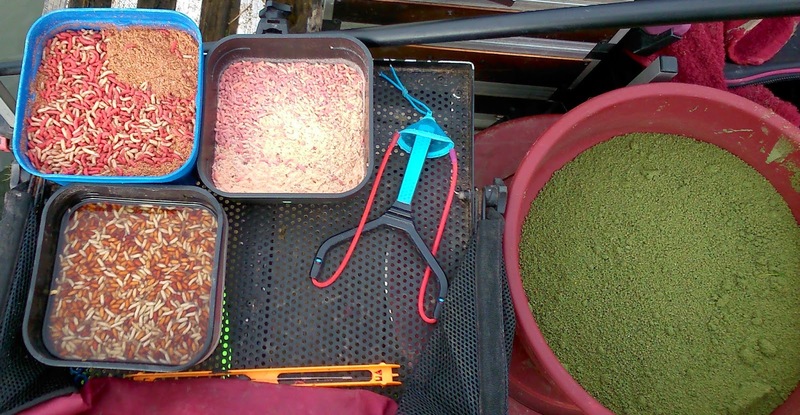 I put a pinch of casters and a few maggots and pinkies in each ball for some feed content. I persevered with the island line whilst I gave the other lines chance to settle. After a bit of swapping and changing, it became apparent that only small fish were the inhabitants of this part of the lake. I did try caster near the tree a few times but I had to wait a fair while for bites and the fish were still small. At the end of the match I had had a disaster, I weighed in 6 lb odd for last in section. On a personal note it put a dampener on the series, as I had 2 section wins and a third up until this point. On a team note we finished 28th out of 50 with 26 points and 91.235 joint weight - What a fantastic and well run event! 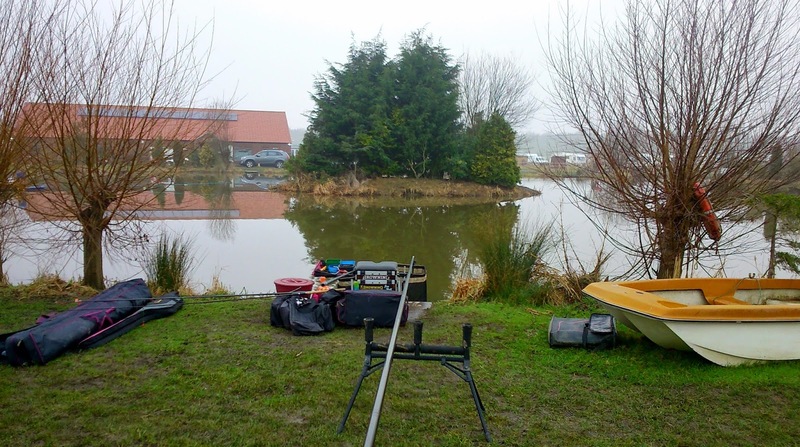 Today was round 9 of the winter league and after what seemed to be an age of not fishing (at least a week anyway!) due to work commitments, I was really looking forward to the match. The weather had finally given us a bit of a break, with no wind and some sunny spells ....woohoo! Over the last few days the temperature has been quite settled, so I was hoping this had put the fish in the feeding mood. At the draw I drew out peg 56 on Bonsai which has a fair bit to offer. It has an island at around 20 meters which provided me with the left hand end of the island to target, as the peg that covers the right hand end of the island was occupied. This peg has proven to be a good area in the past so I was pretty pleased with it. There is also large amounts of open water to target as well. My initial plan was to feed 2 pole lines, both at 13 meters, one line at a 10 o'clock angle and one at a 1 o'clock angle. The plan was to then start the match on the bomb to the corner of the island whilst the pole lines settled down. I also had a waggler set up for for targeting the corner the island too, this was set at half depth just in case the fish were feeding off the bottom. I also set up a short line at a top 2 plus 2 distance, which I planned to fish maggot on if things were difficult. 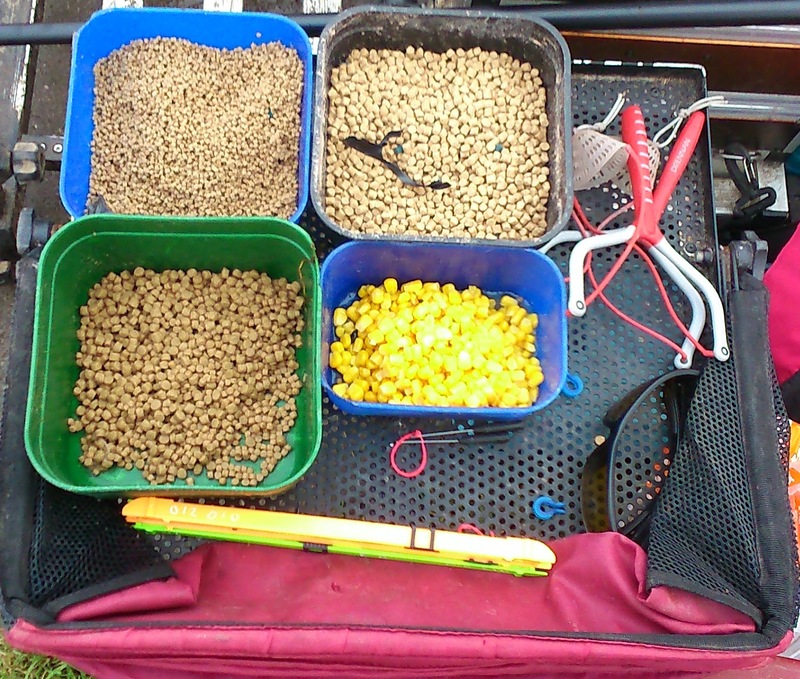 For the pole I had some dampened fishery micro pellets for feed and for the hook I had some 2 and 4 mm expanders. For the bomb I had some corn, bread and 6 mm hard pellets. For the waggler I decided to just go with 6 mm hard pellet. As explained above I also had a couple of pints of maggots as a back up. Hook - Size 18 Kamasan B911 eyed tied with a knot less knot with a hairigged quick stop. I started the session by feeding both the pole lines with around 10 - 15 micros on each of my two, 13 meter lines. I then cast the bomb tight to the corner of the island. For bait on the bomb I decided to start on corn, which over previous weeks has been the best bait for this method. After a biteless 20 minutes and a number of casts to different areas I decided to have a few casts with the waggler. After another biteless 20 minutes and a lot of changing depth and casting around I still hadn't had a single bite or liner. The only real option I had left was to give the pole lines a try; unfortunately nothing materialised on these either and another 20 minutes rolled past with not a sign. Drastic action was needed so the maggot box came out. I started to feed maggots by hand for the short line and via catapult onto the 10 o'clock 13 meter line. I decided to give the 13 meter line a go first, so I baited up with double maggot and shipped the pole into position. It didn't take long for the first bite and a chunky little Roach was soon in the net; this was a welcome sight! The next hour was fast and furious, I was now catching small fish at a rate of knots, I also had a couple of Bream which were more than welcome. I opted to have a go on the short line to try and catch even quicker. This worked a treat as I managed to latch into a few Bream and a couple of Tench too, as well as plenty of Roach. As the match progressed bites slowed right down, so in a bid to keep them going I started feeding maggots via catapult to the island. The plan was to switch to the waggler after 10 minutes of regular feeding. I changed the hook length to an 0.10 bottom and a 20 hook then baited up with a single maggot. 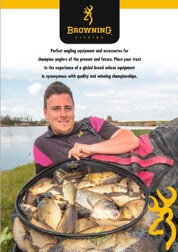 I was into fish straight away, mainly Roach but also a couple of Chublets. I then hooked into something much bigger, which I thought maybe a Carp or F1. I was really surprised when a cracking Chub broke the surface and was soon netted...Happy days! The remainder of the match was spent switching between the 3 lines just to keep the bites coming. 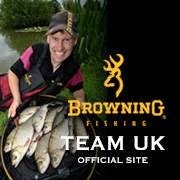 At the weigh in I managed to put 26lb 12oz on the scales which I was highly delighted with. This gave me second in my section behind Andy Bailey who beat me by a pound - Bring on the penultimate round 10!! !